After independence the food habit of Bangladeshi people has been changed a lot. Besides our traditional food consumer of Bangladesh like to take western food also after 1980s. As a result of global marketing this was not too hard for the consumers. Different foreign food companies were established in Bangladesh. Beverage industry is one of them. But more interestingly we don’t know beverage is also our cultural food because beverage doesn’t mean only carbonated drinks. Yoghurt, soup and lacchi are also beverage of our own tradition which consumed for the last 100 years in Bangladesh. But carbonated beverage is new in Bangladesh and today our research is on carbonated beverage market in Bangladesh and consumer reaction to it. Carbonated beverage entered into our market in the later part of 1980. At that time there were only few companies in Bangladesh. But by the change of time and western culture influences it’s become very popular in Bangladesh. By year 2000 more than 12 Beverage Company operating business in Bangladesh and most of them are foreign companies. Soft drinks industry is one of the rapidly growing industries in Bangladesh. Current market research shows a very positive curve for the growth of Bangladesh’s beverage industry in past few years. According to the market analysis the current players in this industry are Tabani Beverage Ltd. who produces Coco cola, Sprite and Fanta. Transcom beverage Ltd. produces Pepsi, 7up and Marinda. Akij Food And Beverage Limited produces Mojo, Clemon and some others. Last but not the list Partex Beverage limited that is producing RC cola, RC Lemon Upper 10 and recently introduced Big Boss. The current market is growing very fast and the growth rate is very high that can be calculated with the help of the following information. Transcom Beverage made about 20 percent growth in the January-June period of 2008 for only the product tagged as 7 up. Overall sales of the company increased by about 15 percent during the 2007-08 fiscal year. Tabani beverage has increased its sales by a billion in last fiscal year. AFBL is a new comer to the market comparing to the others and they are also growing their business in the beverage market of Bangladesh. Partex Beverage Limited, who is the manufacturer of RC cola and Lemons, has secured about 15 percent growth in sales in January-June period of 2008. A drink, or beverage, is a liquid specifically prepared for human consumption. In addition to basic needs, beverages form part of the culture of human society. Despite the fact that most beverages, including juice, soft drinks, and carbonated drinks, have some form of water in them; water itself is often not classified as a beverage, and the word beverage has been recurrently defined as not referring to water. An alcoholic beverage is a drink containing ethanol, commonly known as alcohol, although in chemistry the definition of an alcohol includes many other compounds. Alcoholic beverages, such as wine, beer, and liquor have been part of human culture and development for 8,000 years. Non-alcoholic beverages are drinks that would normally contain alcohol, such as beer and wine but are made with less than .5 percent alcohol by volume. The category includes drinks that have undergone an alcohol removal process such as non-alcoholic beers and de-alcoholized wines. The name “soft drink” specifies a lack of alcohol by way of contrast to the term “hard drink” and the term “drink”, the latter of which is nominally neutral but often carries connotations of alcoholic content. Beverages like colas, sparkling water, iced tea, lemonade, squash, and fruit punch are among the most common types of soft drinks, while hot chocolate, hot tea, coffee, milk, tap water, alcohol, and milkshakes do not fall into this classification. Many carbonated soft drinks are optionally available in versions sweetened with sugars or with non-caloric sweeteners. At present Bangladesh has a very competitive market of beverage. Bangladesh has a relatively hot weather and people tend to be thirstier. So they prefer to take soft drinks most of the time. Beverage took the market of Bangladesh in the first half of 1980. In that time two or three soft drinks were available in the market. But now lots of beverage found in the market. Some of them are popular and some are not so popular. Total 6 product(s) found in category of Beverage for all age groups in Bangladesh.  Kohinoor Chemical Company (BD) Ltd.
Vita Fresh (Orange) is a delicious drink of orange prepared from natural orange juice crystals. No artificial sweetener is added to preserve the natural taste and flavor of orange. Each sachet pack contains 25ge of dried Orange powder enough to prepare a glass of rejuvenating drink. [Net Weight]: 25ge.  The ACME Agro vet & Beverages Ltd.
ACME Premium and Classic mango and orange juices are unique because of their taste and flavor. [Pack Size]: Available in 250ml hygienic UHT packs. Danish Food Products, a Partex Group concern produces highest quality fruit drinks under the brand name Danish Fruit Juices. Bangladeshi customers have welcomed the mango fruit and orange flavored drink hygienically packed in 250ml aseptic packs. Every age group can enjoy this drink, especially when served chilled in our hot summers. [Packing]: Pack/ quantity 250 ml, Quantity /Carton 36pcs, Carton 3 ply corrugated. Pack/ quantity 200 ml, Quantity /Carton 48pcs, Carton 3 ply corrugated. On the basis of an exclusive Franchise for Bangladesh from Pepsico USA, TBL acquired three modern bottling plants at Dhaka, Chittagong and Bogra from BBIL, Dhaka; EBIL, Chittagong and NBIL, Bogra; in March 2000. TBL manufactures the famous Pepsi range of beverages-Pepsi, 7up, Mirinda Orange, Mirinda Lemon, Slice and Soda. As a corporate citizen Pepsico believes it has a responsibility to contribute to the quality of life in our communities. TBL has put into action this philosophy through support of social agencies, projects and programs and the scope of this support is extensive and it has not been difficult to blend with this philosophy since the TRANSCOM group also followed such a corporate ideology. In Bangladesh the choice of young people are always different from other age groups. They prefer to take the following 10 categories of soft drinks. 4. Sanowara Drinks and Bev. md. Ltd.
6. Bangladesh Beverage Ind. Ltd.
7. Sunny Foods and Beverage Ltd.
8. Tabani Beverage Co. Ltd. Considering the market position of the current players in the beverage industry and the overall growth of the beverage market indicate that the market has grown significantly for last few year and the researchers says that it will remain constant on show and increasing at an increasing rate. So, there is a huge opportunity to do something and make money out of this industry, if the company can enter to the market by the time it has forecasted before. The name of my Company will be Jazz Cola Limited. The company will start the journey from the end of 2010. And the company will go for a test drive with the production plant on the middle of the year next year. The products that will be manufactured by Jazz Cola Limited will be available in the market by the last quarter of the year. It will be manufacturing Carbonated Soft Drinks (CSD). Initially it will manufacture the common CSD products, that is very much available in the market to gain a market position and then afterward it will introduce further more product line that will be completely new in Bangladesh. Jazz Cola Limited will produce the traditional soft drink initially and after reaching to the maturity stage the company will start introducing new product lines with something different. Initially Jazz Cola Limited will produce three different flavors – Cola, Orange and lime Soda. But at first it will produce only cola drinks. 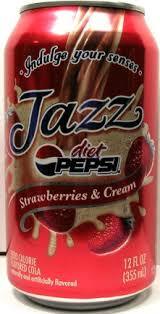 All the beverage products that will be produced by Jazz Cola Limited it will be tagged as ‘Jazzz’. That will be the registered trademark for Jazzz Cola Limited. The vision of Jazz Cola Limited is to create a position in consumers mind that this is the best soft drink in Bangladesh. To earn the success from the statement we will like to earn the faith of our business partner who will have close interaction with the customers so that we can maintain good relationship with them to boost the product demand in the beverage market. We will concentrate on providing quality product in exchange of a very much competitive price. Jazz Cola Limited will maintain two office locations. One in the corporate office from where all the financial and top management decision will be applied and the other one is the production plant where all the carbonated soft drink products will be manufactured. Jazz Cola Limited will start with the main objective of making profit will all other supporting visions. To be more specific the company objectives for Jazz Cola Limited according to some specific category are the profitability, Productivity and the competitive positions as the product will be a new product in the market. The sort and long term objectives are as follow. According to the current market analysis the beverage industry have Jazz Cola Limited can expect to get the break even in the first fiscal year. In that way the company will be interested to make profit from the next year and to increase the profit margin every year. Jazz Cola Limited will be interested on mass production as per the huge market demand of the CSD products in the current market. The Jazzz Cola facility will have as its objective maintenance or improvement of its operating profit margin. Jazz Cola Limited will be the new company in the beverage industry of Bangladesh when it will enter to the market. The primary target of the company will be to make the target audience aware of the product and try to boost the product demand and. The ultimate objective of Jazz Cola Limited will be to lead the beverage market of Bangladesh. All the products that will be produced by the company will be passed through high quality assurance by the quality control department of Jazz Cola Limited. All beverage products produced by the company will be produced with high quality raw materials imported from some technology advanced country. The beverage products will contains al hygienic components and it will be free from any sort of preservatives or any harmful comical. The entire production facility will be under one roof but it will be subdivided by different units. There will be nine subdivision of the production process and all the units will be interlinked in order to support the production in such a way so that the production plant can produce every batch without any interruption or any sort of delay during the production time. The production process of every unit will be completed the following way. The first step of the entire production process is the pre-form processing. There will be an individual subdivision of the production plant to produce only the bottle perform and supply the pre-form to the bottle blowing unit. The entire production will began from this stage with and the Cap processing will also start in the same time in another unit. The second step of the entire production process is the bottle blowing process. There will be an individual subdivision of the production plant to produce only the bottle from the pre-forms. The pre-forms will be collected from the previous production unit and then with the help of the bottle blowing machine this bottle blowing unit will blow bottles in different sizes. 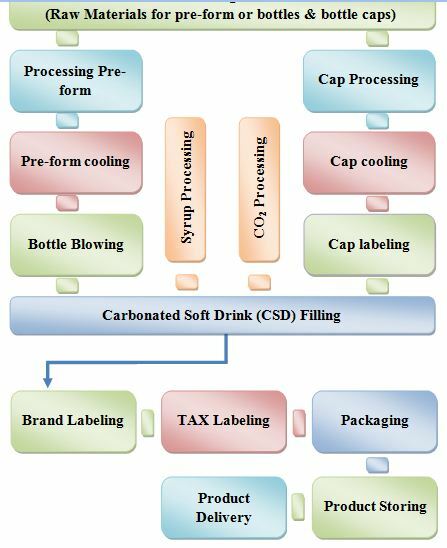 The cap processing unit will start the processing at the same time when the per-form processing unit starts processing the per-forms. The raw material will be the same as the pre-form processing unit, but the difference will be in the processing. The cap processing unit will use the Polyethylene terephthalate or PET to produce the cap for the beverage bottles. The cap labeling unit will start the processing at the same time when the processed per-form will start converting into bottles in the bottle blowing unit. This unit will be responsible for two importance task. One is filling up the caps with a thin plastic layer so that it can preserve CO2 inside the bottle and the other job is printing the labels or brand tags over the cap. The soft drink or beverage is made from syrup and it is considered as the raw materials for any beverage manufacturing company. This syrup will be imported from abroad. Then it will be processed and filling up with mineral water and then it come to a drinkable condition. The entire process will be made under inspection of one unit named as syrup processing unit. Once the production plant completed producing bottles, cap, syrup and the CO2 then the production unit can start filling the beverage in the bottle and send it to the next department. As the filling unit will take the processed goods from the bottling unit and the cap processing unit and then it will take the syrup from the syrup processing unit. The entire job that the machine will be done by the machine at the same time and basically this machine will just combine all the previously processed parts and finish up with almost completed goods. The entire process of this unit will be in that way, the machine will collect the empty bottle from one wing and the completed caps with another wing and the processed syrup and the compressed carbon dioxide will come to the filling machine vertically. Then the machine will fill the bottle with the syrup and carbon dioxide and put the cap on it and then it will released the almost completed goods to the labeling and packing unit. The filling unit will release the filled bottle to the labeling and packing unit and the responsibility of this unit will be to label all the products and package it. There will be different products realizing from the filling machine. The labeling unit will be responsible for labeling the right product with the right label and pas the labeled product for Tax labeling and then the product will be a complete product. After completing the all the labels including brand labeling and the tax labeling the packing and labeling unit will be responsible to move the entire product to the finished good storing unit. This unit will be responsible to receive completely finished good from the packing unit and delivering the finished good to the transport division in order to ship to good to the local or district dealers. The storing department will collect the finished goods from the labeling and packing department and then it will also be responsible for preserving the product in the finished good storing unit until the product goes to the transport division for shipment. There will be three departments in the production plant. Those are- Processing Unit, Making Unit and Packing and Labeling Unit. The entire production process of Jazz Cola Limited will completed in nine different stages and the process will be dependant to at least one previous unit except the first firs unit. The following diagram will illustrate the entire production process.